Last month we gave you an insight into Cornish choughs and what people are doing there to help them. This month we continue our travels and will take you north across the border to Wales. Known for its lush valleys and majestic mountains, Wales is also home to about three-quarter’s of the UK’s choughs. The Welsh name for a chough is brân goesgoch meaning ‘red-legged crow’. 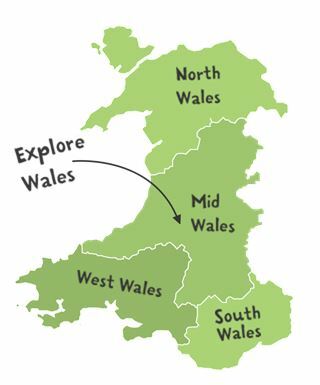 Wales is broadly categorised into four regions; north, mid, west, and south. Choughs can be found more or less along the entire Welsh coastline from the Gower Peninsula in the south to the isle of Anglesey in the north. They can also be found inland from the coast nesting in abandoned quarries or mineshafts. Most famously at the Llechwedd slate caverns , North Wales, where a pair are known to nest much to the delight of the tourists deep underground. A video made by the RSPB gives you more of an insight and can be viewed here. Over the past two decades researchers working with these choughs have seen more and more inland nests becoming abandoned and breeding pairs disappearing. Ceredigion had five breeding sites in the late 1980s. Ten years later it was down to one. Montgomeryshire has seen a complete loss. It is believed that the boom in natural predator numbers, namely peregrine and goshawk, has not helped matters. Silurian shale coastline in Mid Wales. Coastal nest sites are also under threat, but in this case it is due to natural erosion. A lot of the coast is limestone, sandstone, or shale and easily erodes. 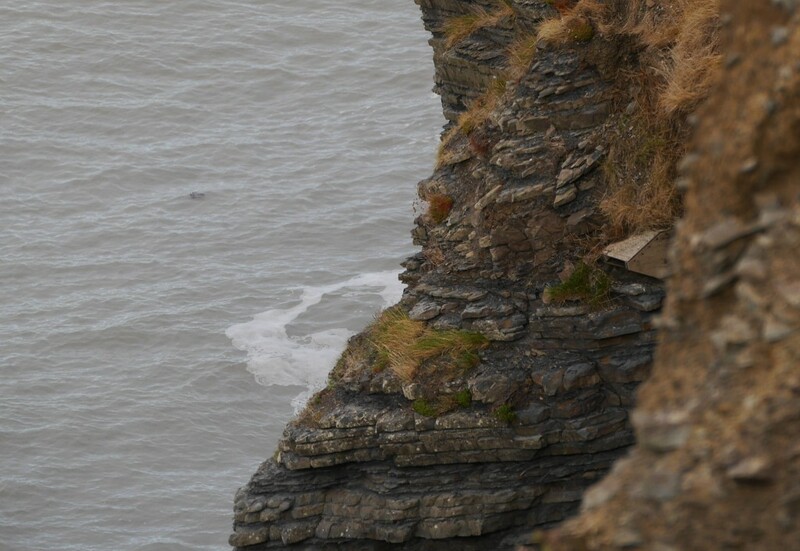 Looking at the photo on the right you wouldn’t think a bird would chose to build a nest on these cliffs. Yet they do, often with success, although a few years down the line the ledge might give way falling into the sea and a new nest will need to be built. Nest-site availability is a very strong limiting factor in population expansion. In the late 1980s Scottish researchers had already shown the effectiveness of providing choughs with artificial nest-sites. 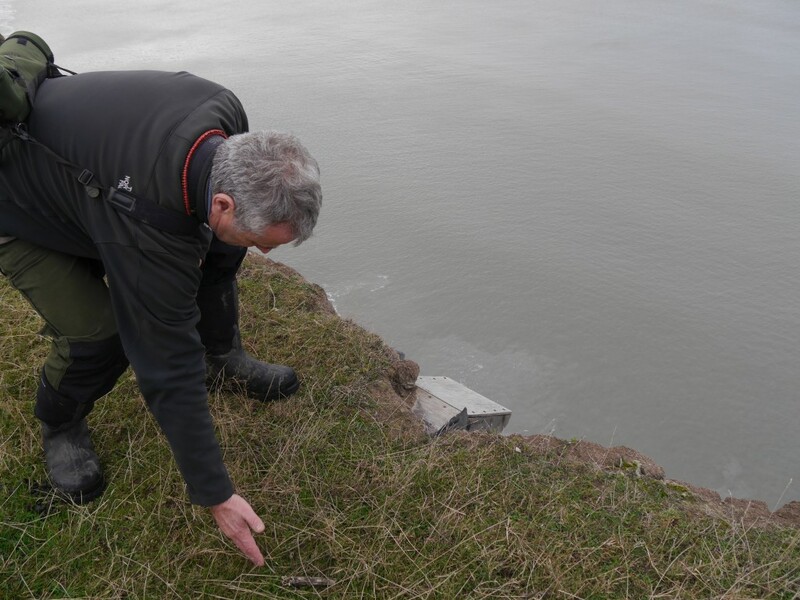 Wales took on board this advice and started providing nest-boxes or ledge supports at various coastal sites. 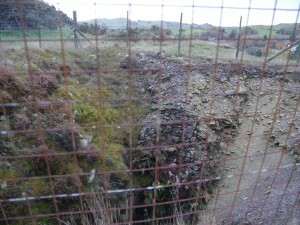 Within a few years just over two thirds of the artificial sites were being used. As of 2008 choughs at 22 artificial nest-sites successfully raised a total of 335 fledglings! 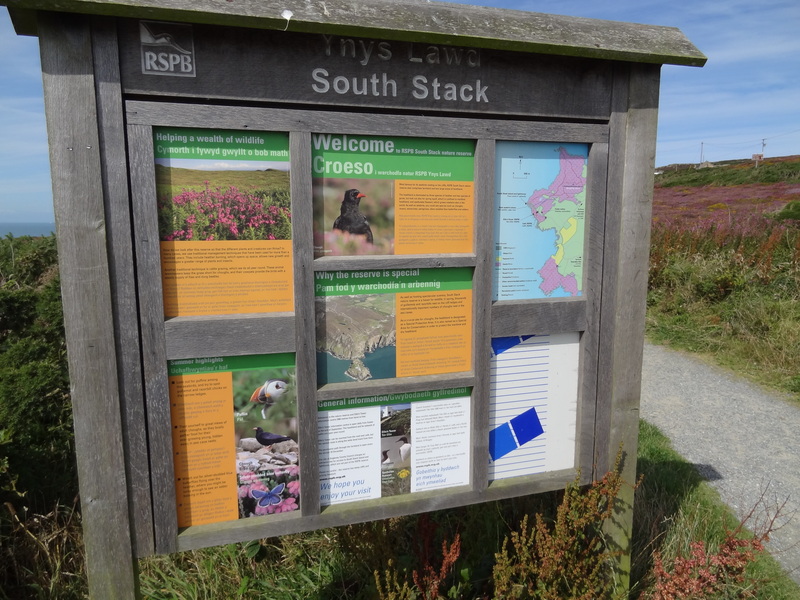 On a recent holiday to Wales I had the privilege of meeting Tony Cross, a champion chough supporter and the person responsible for designing the artificial nest-boxes (which we use at the Wildlife Park). Tony very kindly spared time to show me around some of the sites and teach me more about the Welsh choughs. Having ringed over 4,000 choughs and followed many individuals for several years there is a lot we can learn from him. This area was once used by choughs to raise chicks, but has now been abandoned. 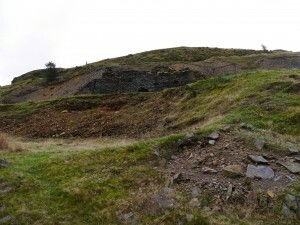 An abandoned mine shaft once used by nesting choughs. The first stop was at an abandoned mining area where a pair of choughs used to nest. It is hard to see from the photos, but they chose a spot down a deep shaft which kept them fairly well protected from nest predators. The land around looks quite healthy in terms of insect availability with cattle grazing pastures and its away from built up areas. 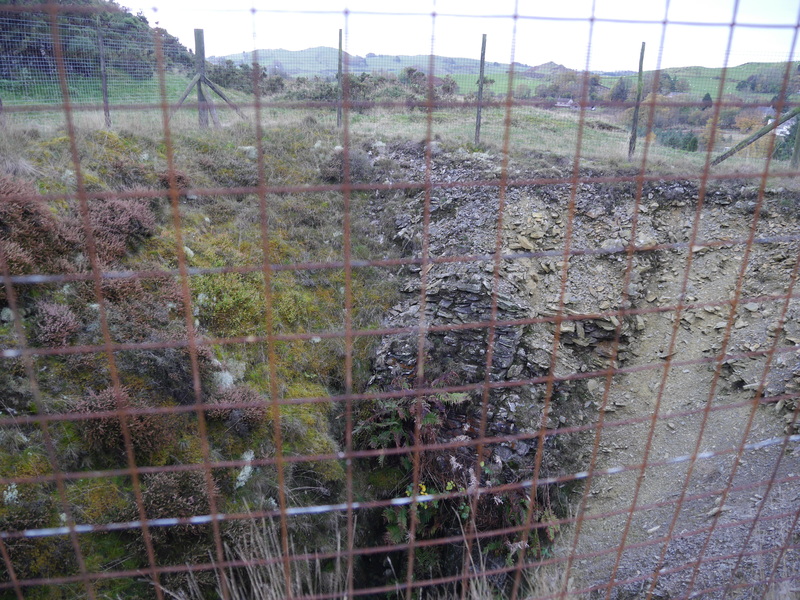 This is probably one of those sites which ‘suffered at the talons’ of the goshawk (although great news for the goshawk I guess). 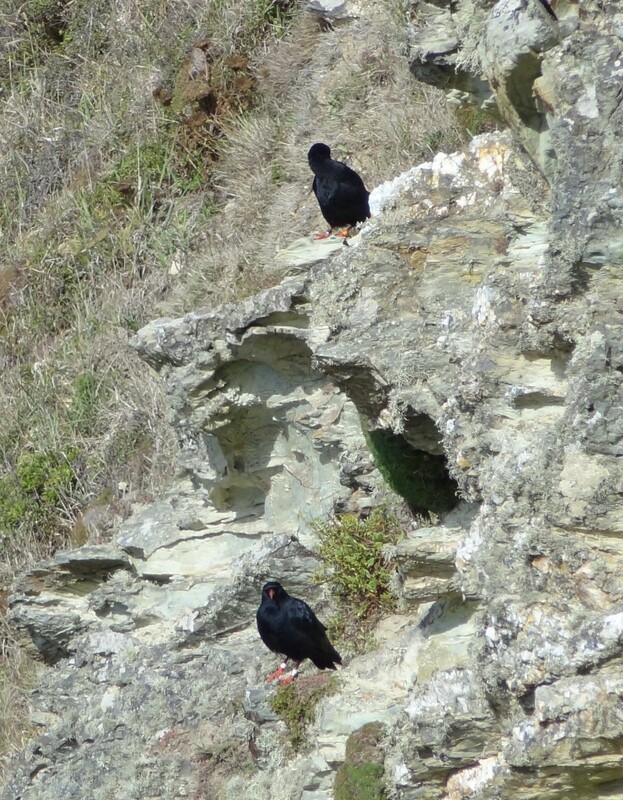 As it was outside of the breeding season we didn’t disturb any nesting choughs. Tony is a licensed ringer and licenced to approach nests. I would not have been able to do this without him. 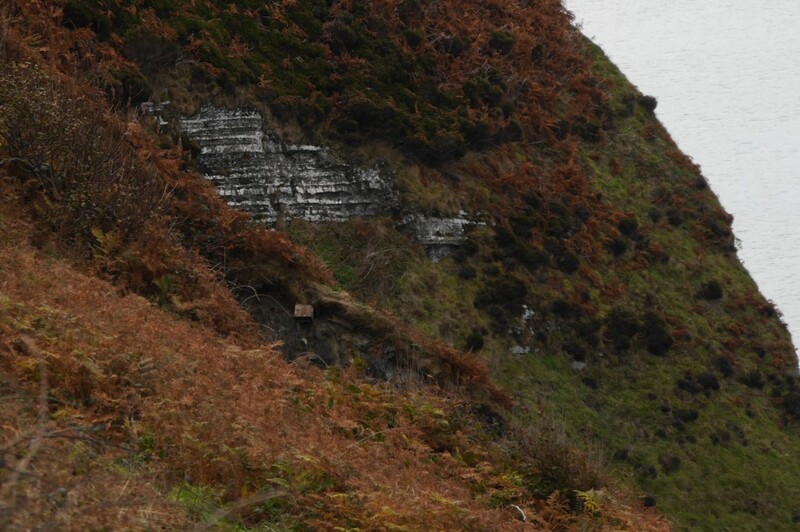 We then drove to the coast to take a look at some of the nest-boxes Tony and his colleagues have fitted to the cliffs. It is quite a challenge as they have to find a site that they can access, but at the same time deter egg collectors and the like from reaching it. In recent years Tony has sadly found activity at boxes suggestive of human raids rather than natural predators (and we thought those days were over). One clue being that ravens don’t need to use ropes! Nest-boxes are positioned away from potential land predators in areas where choughs are trying to breed naturally but fail. The boxes are constructed from either marine grade plywood or Ecosheet©, a recycled plastic boarding. The shape is designed to mimic a natural cavity so they are quite narrow and deep. Tony Cross indicating how far back the nest-box reaches. This one is unusual in that it is positioned on top of the cliff. The front of the box has and overhang which, apart from acting as a deterrent to something trying to reach in, makes it feel a bit more enclosed and sheltered for the birds. One factor Tony did not consider when first designing these boxes was how badger-proof they would need to be. Don’t be alarmed, Welsh badgers have not adapted to have opposable thumbs and learn rope skills. They do, however, burrow and at one particular sight they have given the nest-box a bit of a battering pushing it out of place. One nest-box needs re-positioning after a run in with badgers. The boxes need to be checked each year as they do suffer from being exposed to the sea air. As long as the roof remains dry and there is no risk of collapse the boxes can be used for several years. It normally takes a year before a breeding pair move in to a new box. Lots of HSE forms to fill in, quality control tests, and the long wait for the Royal Court date (Jersey in-joke sorry). It is clear that the work Tony and his colleagues are doing has made a great difference to the Welsh chough population. Jersey’s choughs may well benefit from the same practices as these birds have no experience of wild nest sites and will need some encouragement. We have to erect nest-boxes for our Jersey choughs and these should ideally be in place within the next six weeks to give the birds a chance to find them. Is it thought any of the six older birds in the Jersey flock will be old enough to breed successfully this coming spring? Martin. Many thanks. This is going to be a very interesting spring. At least two of the birds are potentially old enough to consider breeding this coming season. They will be at a minimum age really so it might be the case that they have a go at nesting and we would not be too surprised if it didn’t come to much. It will be interesting to see where they choose to go and how they react to the other birds. I was reading an article recently on the choughs of the scottish isles and a study has been made on their decline. They seem to have come to the conclusion that the decline was due to young birds not surviving the first years after fledging, and not being able to find food. I wondered why these young birds did not follow the adults to learn where and how to forage for their food, is this normal behaviour for choughs?. And i think that even the adult birds had trouble finding food in winter mostly, so were given extra mealworms at a feeding station. I was just curious as to why the young birds failed to learn from their parents. Thanks and really good article. Young choughs do learn where the food is from their parents, but the problem is that at some times of the year there are food shortages, that is why we have to feed the birds in Jersey to get them established. 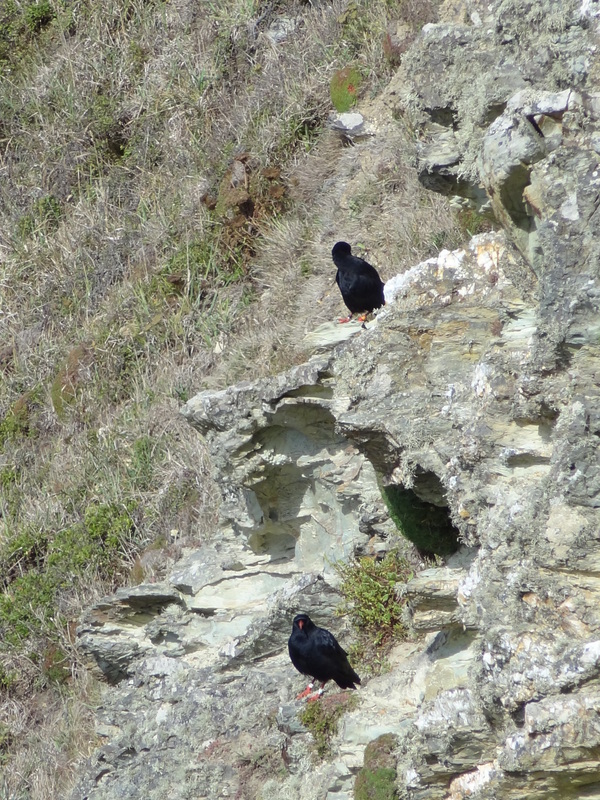 The post-breeding season is vital for young Choughs. In West Wales, the birds (adults and sub-adults) gather together and feed communally where for sure a lot of learning goes on. Problems can arise in drought conditions when substrates become hard to penetrate and invertebrates aestivate; wet and cold summers provide their own, more obvious, challenges of course. Supplemental feeding, in my opinion, should be restricted to times when stressed behaviour reveals its necessity, or in a pioneering situation, such as on Jersey. The post-breeding season is probably the most challenging time for Choughs. 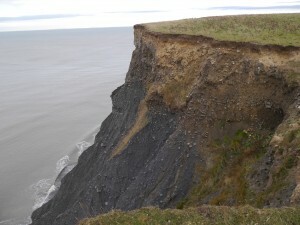 Providing there is sufficient optimal habitat (natural cliffscape with plenty of exposures in association with sympathetic agriculture), they can cope with winters pretty well, even severe ones. There will be natural mortality of course, but this will only threaten relict or founding populations. Otherwise, ideally you do not want wild birds to become dependent on an artificial food supply like mealworms. Most studies on supplemental feeding show that birds use the additional food to top up on what they cannot find naturally. Giving hand-outs does not cause the birds to become dependant on the supplemental food. I suspect the Jersey choughs will become independent of supplemental food when there is enough natural food available. I think my reference to pioneering birds on Jersey shows that I’m not disagreeing with this. By your final sentence, Carl, do you mean when birds have learned better, or by creating more suitable habitat by sympathetic agriculture, clearing scrub, or some other means of creating more eroded zones & earth exposures? I’m very interestyed in this and wonder if you think it possible to prioritise those or other methods on Jersey? The approach to reintroducing the choughs to Jersey is different to traditional approaches in that we are continuing to manage the birds since the habitat is probably not yet suitable to hold a viable population. The Choughs being they are high profile and popular will help drive the restoration. The releasing of very young birds and then supporting them is highly successful in a range of birds and gives far better survival results than traditional approaches. I suspect that the Choughs will become less reliant upon hand outs during seasons of food abundance but will not be independent of feeding until the habitat is restored. They should try and breed this year and we need to ensure they have suitable nest-boxes, that are placed so they can be carefully monitored and if necessary so we can manage them. Ideally we should be able to rescue eggs and young if they are failing,and foster captive bred young to the nest if it is appropriate (e.g. if their own eggs do not hatch). During this establishment phase we need to give the Choughs all the support we can. If the habitat is not yet considered to be good enough, would any wild-hatched chicks need to imitate their parents and become at least partially dependant on supplementary feeding for longterm survival? In my experience with several species of reintroduced birds that are supplementary fed, they behave naturally and develop all the appropriate foraging skills and top up with the hand-outs. The habitat will of course be able to provide much of the choughs food, and there will be seasonal trends in the amount of additional food that they take. We feed birds in our gardens in the Winter but as soon as Spring arrives they become less dependant upon us. Is any Chough-related habitat survey available or published? Not knowing Jersey very well at all, as asked earlier, I’d be keen to know more about the habitat restoration programme – strategy and tactics.